“Nibble, nibble, little mouse, who’s that nibbling at my house?” That’s the most famous question in the German fairy tale “Hansel and Gretel” by the Brothers Grimm. The nibblers in question are Hansel and Gretel, who are looking to satisfy their hunger after wandering through the woods lost for days. They can hardly believe their eyes when they see a house made of bread, cake, and sugar. 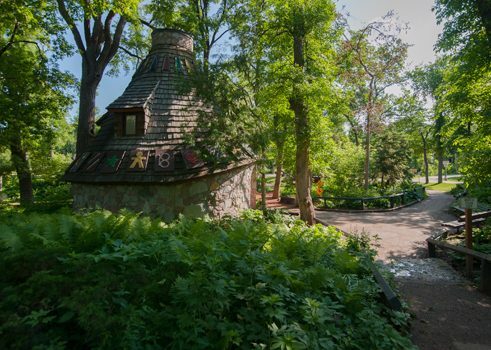 You don’t have to be completely lost to reach the witch’s house in Kildonan Park in the north of Winnipeg, but just standing in front of the round, rustic hut gives the feeling of being in a fairytale forest. Surrounded by dignified elms, this round house called The Witch’s Hut is located directly on the Red River. The atmosphere is enchanting and magical, and visitors to the area come across a piece of German fairytale culture hidden in the shadows of the trees. The Witch’s Hut in Kildonan Park | © Goethe-Institut Montreal The hut was built with an eye for detail and looks so ready to eat, you would almost want to break off a piece of the house, just like Hansel and Gretel themselves. Hans-Peter Langes - a well-known German architect in the city - designed this unconventional witch’s house, which clearly breaks away from the design of traditional witches’ houses. John Nelson was responsible for the masonry, using stone to build the round foundation topped by a peaked roof. In winter, the wooden roof tiles are covered with a blanket of snow. The peaked roof is dotted with a few small windows and colourful, translucent tiles, which gives the inside an atmospheric, dreamy light. The terracotta floors depict sequences from the fairytale of Hansel and Gretel, which were drawn by the illustrator Elfride Berger. In the Witch’s Hut, you can also find figures of Hansel, Gretel, and the witch. These figures were made by Josef Potempa. In the summer months, tours are regularly offered and there are fairy tale readings held inside the house. In this magical atmosphere, fairy tales and fables by the Brothers Grimm, such as “Hansel and Gretel”, “Cinderella”, “Puss in Boots”, “Sleeping Beauty”, and “Little Red Riding Hood”, all come to life in the listeners’ imaginations. The German Canadian Congress of Manitoba, in cooperation with the province of Manitoba, makes sure that entering this fairytale world remains possible to this day for the children and adults of the province, as well as for all tourists.